Become a kindly doctor. Or deck out your sweet apartment. Or become a reviled maniac who only talks to trees. All of these choices are yours when you play the Sims series of games. Easily the Electronic Arts’ most anticipated title of this year, The Sims 3 will launch on June 2nd for not only the Mac and PC, but also the iPhone. iPhone owners can look forward to playing the mirth-filled, quirky, and addictive person simulator in a handy mobile version. The ambitious project aims to be the deepest, richest, and most graphically beautiful game released to the iPhone to date. 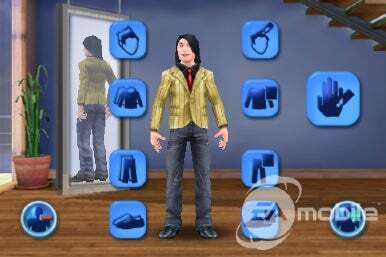 This mobile version of The Sims 3 lets you customize your character using touchscreen controls. At EA’s Redwood Shores headquarters, I was lucky enough to get a personal preview of this exciting title. We started off by walking through the character design setup screen that defines the look of the player’s avatar, the Sim. Despite the small platform, I was surprised by the high quality graphics and the level of depth for customizing your character. You can control weight, skin-color, facial features, clothing, hair, etc. After making my character, a mohawked dude with a nifty t-shirt, we walked him around his neighborhood. Dreyer and Taber are calling the Sim’s town a “living neighborhood” where players can experience robust interactions with the different Sim personalities. Dreyer cites the game’s Artificial Intelligence — AI — is something they especially focused on; EA Mobile wanted to ensure the Sim could fend for itself in “self-reliant” mode and the other Sims in the world go can about their own daily routines. Fans of the previous editions of the Sims often cited the focus on bodily functions as an annoying chore, but with the Sims 3 you won’t have to constantly make sure your Sim goes to the bathroom or eats. On self-reliant mode, Sims will take care of themselves, or you can override the feature and guide them yourself. Interact with other Sims playing The Sims 3 on your iPhone or iPod touch. It’s easy to guide your Sim around the world by tapping on the iPhone’s touchscreen. We watched as my Sim talked to a new acquaintance and tried to make friends. If you’re too forward, the other Sim your character is interacting with will think you’re creepy. On the other hand, if they think your Sim is acting silly, they’ll show genuine expressions of mirth. Conversations are displayed with little icons in speech bubbles, but they’re actually not indicative of the topic of conversations Dreyer explained that the icons displayed in the conversation bubbles are random, which explains why your character may discuss toilets or corn-on-the-cob during a fire. Not only can you interact with other Sims, but you can get a job, explore the world, and fill the individual Sim’s wishes and needs. During the demo, Mr. Dreyer showed me how to command my Sim to cook. There’s a cooking mini-game that requires the player to pick up the pots in order to have them cool. If you leave a pot on for too long, your food will be burnt and inedible. The interface, though small, was nonetheless intuitive. The cooking mini-game isn’t just a side distraction, as the game progresses, your Sim can invite others over for dinner. Better not burn the spaghetti then. The iPhone version may not sport every amenity of its Mac counterpart, but it still provides a rich, detailed world to explore. There are some differences between the iPhone version and the Mac version, of course. Unlike the Mac version of Sims 3, recently previewed by Macworld, you won’t be able to completely overhaul a house and spend hours focusing on its every detail. Instead, you can upgrade it as your Sim levels up. You can acquire bigger and more rooms, better furniture, etc. The developers sought to “ensure the core user experience was strong,” explained Taber. The graphics and file sizes are less than the computer version, but they’re nonetheless impressive for the iPhone platform. In fact, this may be the first 3-D iPhone game to depict actual facial expressions. Like anything in the Sims universe, there are lots of little details throughout that will give players reason to smile and in many cases, laugh. The morbid sense of humor that accompanies the Sim universe is intact as well. My favorite element of the game was the different personalities that you can play with and their own goals. If you select the “maniac” persona, you’ll have some unique wishes and opportunities. You can satisfy your social interaction requirement by talking to trees. Your life goals may include peeing in every toilet in town. Or watching three people sleep. The skeptic in me wonders if an intricate game like the Sims can be converted to a mobile platform so seamlessly. While the spirit of the Sims 3 seems to have been ported to the iPhone, I wonder if their attempts to cut out the fat of the game they may have cut out much of what you can explore and do. Still, EA claims it’ll take the player around 12 hours to beat 70 goals in the game, and that proposed run time is nothing to sneeze at. There’s also a high degree of replay value, not to mention more goals, if you replay the game with a different personality and steer the Sim’s life differently. Instead of getting a kind, nature-loving all-around character, why not go for a shy, combative, maniac? Not only will your character have different wishes, but the other Sims will respond to them differently as well. Look for the Sims 3 on the App Store on June 2nd.